Pros: A very cheap manual knife sharpener that provides proper sharpening angle every time. It is long enduring, compact and beginner friendly as well. The pull through knife sharpener KitchenIQ 50009 Edge Grip is not only an elegant looking one, but also a great tool for the busiest of chefs. I own an extensive collection of knives – for any kitchen task you can imagine. If you are a gourmand like me – as well as a cooking passionate – save yourself from tons of frustration and buy a knife sharpener that is truly worthy. No doubt you will be in need of this. Sharpening rods that come with most sets are rarely that professional thing your knives require. Sharpeners I’ve tried in the past would work so well with big knives, but just wouldn’t handle the small ones. Or vice-versa. It was quite troublesome finding one to handle all. Basically, I was supposed to buy and try them on the knives I had. Luckily, the 50009 was great for all sizes. Don’t thin, however, that you have to alter the moves in order to deal with these different sizes of knives. The procedure remains the same, always. I did this and can’t tell there is a difference between my sharpened small knives and the big ones. You might imagine that a professional sharpener like this is made only for the experts in the kitchen. In fact, these are created with the average user in mind. It’s all made easy so that anyone can restore the edge to their knives. You don’t need to figure out any expert move or to possess any great skill. Also, you need not worry about how much of the edge it’s going to eat away. It only takes a little, no matter what you so. Besides, I could notice that the sharpening angle is just perfect. It’s really easy to ‘get it’ from the start. If you are still anxious about the procedure, you can look it up on this YouTube video. Amazon customers rank the KitchenIQ 50009 Edge Grip among the best tools of its kind. This is especially for its ease of use. Also, it is long-lasting and does not take up much room. The design is compact and attractive. There are hundreds of reviews for this knife sharpener already, which proves the product’s popularity. See this for yourself and do check it’s average rating. If your knives have serrated edges, this product is not for you. However, it will get the straight-edge ones back in shape as easily as you count to 10. I know a couple of customers who have complained about the quality of the blade after it’s been sharpened with the KitchenIQ 50009. It got my attention, since it was supposed to work on any brand of kitchen knives. However, when I questioned them about the procedure, I understood what went wrong. They only passed the blade a couple of times. It takes 10 passings to get it sharp. Just stick to the number and you will not have a reason to complain. 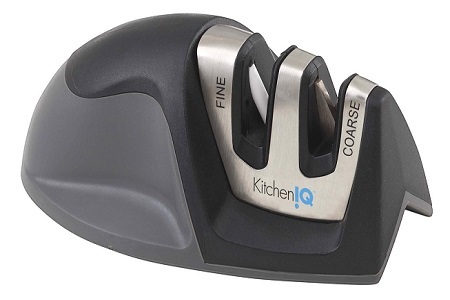 The KitchenIQ 50009 Edge Grip is a long-enduring, compact and novice-friendly knife sharpener. Restoring your knives’ edge will no longer require you to have any knowledge on angles and moves. This is a great tool for beginners but also for the experienced chefs. In addition, its price is something most of us can afford.